Social Recruiting w/Facebook – One or Two Facebook Profiles? Do you use Facebook to source and recruit potential candidates? If yes, do you have one or two profiles? One of the most common social recruiting questions I get is whether or not sourcers and recruiters using Facebook to search for and engage potential candidates should have 1 or 2 profiles (one “personal” profile and one “professional”). I always answer that my recommendation is for recruiters to use only 1 Facebook profile (read further to learn why), but I can certainly understand why some people would want to use 2. To see if I was alone in my position, I was curious what the folks in my network would say regarding the use of 1 or 2 Facebook profiles for recruiting, so I decided to ask them (on Facebook – where else?!?). As you can see, I got quite a few responses! If you want to weigh in, you can click on the image below and leave your comment. Most of the responses were in favor of only using 1 Facebook profile, which actually isn’t that surprising (at least to me), given that many of the people who responded are seasoned industry and social recruiting veterans. In my experience, it seems that many people who are concerned about using 1 profile when recruiting on Facebook are newer to social recruiting (real social recruiting, not just posting jobs on social sites), and/or haven’t yet really experimented with recruiting via Facebook. 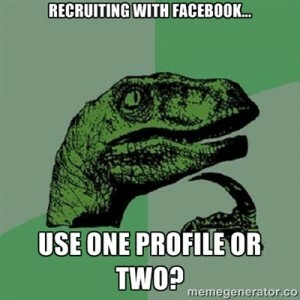 Now, let’s take a look at the arguments for using 1 or 2 profiles when recruiting on Facebook. These are all seemingly valid concerns – at least on the surface. However, I have answers for all of them, which I’ll address next. If you create 2 Facebook profiles, I’d challenge you on the idea that you can be just as “social” (2-way engagement) with 2 Facebook profiles on top of your LinkedIn, Twitter, Google+, etc. profiles. If you’re friending candidates, you’re creating a false impression and expectation, as I am sure they consider being “friends” on Facebook a little differently than you do (e.g., they don’t have a “professional” profile). Connect with them on LinkedIn, follow them on Twitter and/or add them to an appropriate circle on Google+, but don’t “friend” them on Facebook. If you have 2 Facebook profiles and your personal profile is the “real” you, what is your “professional” Facebook profile? #4 Facebook privacy settings and lists work – so use them! You can easily configure lists and your privacy settings on Facebook so that only certain people (friends or not!) can see specific personal details, pictures and posts. Even so, why “hide” pictures (of your kids or otherwise) and other personal details? Your personal content serves as evidence you’re a real person, and hopefully a decent one with good judgment. If I message someone on Facebook and they check out my profile and see pictures of me with my family, I become a real person to them, not just another recruiter. And guess what? If they have kids (or dogs, or a life), my profile will likely resonate with them better than some scrubbed and cleansed “professional” profile in which no one can really tell anything about me. You shouldn’t have 2 Facebook profiles because, well, Facebook says so. As such, Facebook can shut down one or both of your profiles at any time, as Marvin Smith painfully found out while at Microsoft. Legally, a person creating 2 Facebook profiles is violating Facebook’s terms of service. Period. Beyond that, creating a 2nd “professional” Facebook profile is at the very least somewhat inauthentic and antisocial recruiting, and at most – totally so. If you’re concerned with privacy, don’t “friend” candidates and/or simply configure your settings so that only your true “inner circle” can see your “for their eyes only” content. This can easily be done via Custom Privacy Settings and well configured Friend Lists. But enough of what I think – what do you think?